The Other Adventist Home: "Suffer the Little Children to Run in Church"
Hi, my name is Laura, and my kids run in church. I used to have an excuse for it--we were the pastor's family. Everyone knows about pastor's kids, after all. My official stand was that I'd decided to embrace the stereotype, rather than fight it. But I don't have that excuse any more. I do make efforts, of course. I dress them in comfortable clothes, so we don't get unneeded grouchiness. I take them to Sabbath School, so they know church can be fun. We wait in the lobby as long as possible, to limit the time of confinement. And then we take a deep breath, and walk into the worship service, armed with snacks and books and toys, and prepared to hear very little of the sermon, keeping them quiet and happy. But we're all tight as a bowstring by the time church ends. They are ready to be let loose. And because I don't want to come and go without speaking to anyone, I stop and talk. And they run. We've moved churches twice since the twins were old enough to toddle. There's something nice about those first two weeks, when they're still in awe of their new surroundings. But by week 3, J has always decided he owns the place, before I have a chance to make relationships with people there which will give me the benefit of the doubt regarding my parenting. There's always someone ready to step in, and give my children the instruction I must be neglecting. I have seen a lot of childless churches. And I've heard a lot of church members say how much they love children, and want to hear their footsteps and little voices in their halls. And who doesn't want those perfect doe eyes when they're extorting the children's offering? But kids come with baggage. Specifically, they come with noise, motion, and Cheerios to grind into the carpet. 2. Kids are in motion. They run. They run everywhere. And they usually move too fast to notice someone telling them to slow down. If you're going to have kids in a church, they will run--in the lobby, in the sanctuary, around the potluck tables. Please don't waste valuable time expecting something else. 3. Kids are messy. They drop their snack crackers, and don't finish their potluck food. They leave their Sabbath School crafts in the lobby, and pull the sharing books out of the give-away display. And since they're loud, and in motion, their parents might not notice the messes as they try to keep up. Parents might make noble efforts (or you might think their efforts aren't noble enough), but they can't change the fundamental nature of childhood. And they shouldn't. Because it's not moms and dads who made their kids this way--God did. I can't vouch for what he was thinking, making my kids in the form of perpetual-motion machines. But I know I don't have power to recreate them--just to nudge them along in the growing up process that's going to take (let's face it) a lot of years to achieve. So if you want children in your church, the ugly truth is that you'll have to suffer. "Suffer the little children to come to me . . ."
Lucky thing, there are good reasons to suffer cheerfully. First, you should do it because they need to you to. Yes, I know that hearing the sermon is important. Walking safely in the halls is important. But running in church is important, too. No, I'm serious. Well, to be precise, being accepted and loved in church, in spite of child-like habits, is vitally important. What children learn about God has less to do with their Sabbath School lesson, and more with how the adults treat them there. They may be slow in the critical thinking, but they're razor-sharp about feelings--your feelings about them to be exact. Kids believe in what they experience. And how they feel about their church experience IS their theology. Do you want them to believe in a God who's loving, gentle, encouraging, interested in their cares, and forgiving of their honest mistakes? Then you have to show them what that means. What do those words look like in real life? They won't learn it if they come to church to be shushed, halted, and disapproved of. If the church is going to pass the gospel on to a new generation, then being a kid-friendly place has to be a priority. But it's not just for their sake. If kids believe what they experience, so do we. No matter what words we use to describe our theology, we believe what we live. When we pay more attention to someone's behavior than their hearts--as in, when we let ourselves judge them for being loud, or inconvenient, we do ourselves the most harm. Whether we mean to or not, we'll find ourselves worshiping a God who does the same. We are always our best selves, as a church, when we stretch to accept children. Many years ago, one of our small Pennsylvania churches did a monthly "family Sabbath School" where the adults and kids did the morning lesson together. We took the adult lesson, and taught it with songs, and play-acting, and interactive questions. ** I was hoping to draw more families to Sabbath School time. I didn't get as many as I wanted, and thought we should give it up (it was a lot of work), but the seniors objected. It turns out, the things we teach children are the building blocks of our faith. Lessons like trust in God's protection, love, and service to others, are the most important ones we learn. Teaching kids centers us back in the gospel. The truth is that the generations need each other. Adults need kids as much as kids need us. It's not an advantage that every church has. So if your church is one of the lucky ones, and you get to put up with the noise, and motion, and mess each week, make the most of it. Get acquainted with the children, and their parents. Look past the chaos, and enjoy the personalities. And if you need to, sit closer to the speaker. "Let the little children come to me . . . " And be advised, they're going to come at a run. *It's true that kids can speak up with a microphone in front of them, but this usually happens when they are unscripted. And that's a story for another day. **Credit to Jeanne Hartwell, who created the Pennsylvania Conference Campmeeting's morning Family Worship meeting, from which I stole the idea. My 4 sons were not quiet. And unfortunately, because we were a bother to others, we stayed away from church for months, months I will never be able to retrieve, and neither will my sons, now adults and out of the church. A decade or so ago, a visitor came with her children. One was Autistic. He had a 'melt-down' with some aspects, and later others commented on that family's parenting. They never returned, though I did my best to encourage them to. Oh, how I miss being in a church with little ones! Please don't get discouraged and disappear as I did. Don't listen to those with loud complaints about your little ones making noise or activity. Come, and let those of us with empty arms be 'grandma' or 'grandpa' to your little ones for the day (or a lifetime). God bless you and all the parents of our future. Thank you, Laura! God loves the little children--He made them wiggly and spontaneous (and loud, sometimes disruptive). It is our opportunity to grow, especially those of us who were taught that God is looking down, making sure that we are being reverent in church. What a privilege to share the love of Jesus with these little ones, letting them know that they are TREASURED by the God Who made them and LONGS for their company forever. You are so right on that how we treat these children gives them either an invitation to that forever relationship or makes a distaste for it. And as far as missing out on the sermon, God will enable hearing what He wants to be heard. He cares about us all, but the children are special to Him. A friend of mine was a preacher's kid. When he was little his mom and his siblings sat up front to their father's left. One Sabbath at a new church he decided to test his limits and began making disruptive noises. His father had just stood up at the pulpit and his attention was caught by the noise emanating from the part of the sanctuary where his offspring were seated. His father gave the offending child "the look". The boy looked back and grinned. Then, to my friend's horror, his father turned around and waved the head elder to the pulpit, turned again and strode purposefully down from the dais and was headed his direction. His dad reached the end of their row and motioned for him to come. Here he made his next error in his attempted struggle for power. His father in two steps reached him, scooped him up under one arm and headed down the side aisle with his son tucked securely under one arm. As they rounded the back corner of the sanctuary and headed toward the door, the boy gave one last kick in despair then looked out over the congregation, which by now was thoroughly distracted by the sudden family drama involving their new pastor. "Pray for me!" he cried as his father swept out the back door. The congregation roared with laughter. But, my friend learned not to pick a fight with Dad because even if he was in the pulpit, he was not afraid to discipline his sons. The congregation was treated to a little peek into the character of their new pastor and rather enjoyed it. We just moved to a new part of the country...far more conservative than where we moved from. Every single church that we have been to here actually has signs outside the sanctuary quoting Leviticus: "Thou shalt reverence my sanctuary." I asked about having tea in Sabbath School once (because they provide hot water and tea downstairs, and another woman had some in SS). The reply was concerned and wide- eyed, "Well...I mean, I guess...in the sabbath school room...just as long as it isn't in the Sanctuary of course!" In one church they even put a notice in the bulletin to "Please enter and exit the sanctuary quietly each week." I gotta tell you, I have never been so anxious in a church in my life! I have children! Either my daughter gets a snack & water IN church,or guess what? I have to LEAVE the church service in the middle of it and go downstairs (because there is a sign at the bottom of the stairs that leads from fellowship hall to the level with the sanctuary and classrooms which said 'Please no food & drink beyond this point) to take care of her physical needs for food and water. No, she isn't loud about it, and she doesn't fuss or complain. My son can wait, but my daughter just can't, and I mean can not wait (physically can't wait...she has a digestive disease and is constantly on the verge of being unable to grow, so this girl seriously needs every calorie she can get...when she doesn't eat every time she gets hungry then she sometimes stops getting hungry, and yes, she is under the care of a slew of physicians). Sure, I could (and probably will) talk to the pastor and explain her situation. Maybe they will stick with valuing their carpet more than children and their families, or maybe the medical needs of 1 child will be more important than the carpet, I don't know. But they always say how they just dont understand why there aren't many children there...this beautiful blog post explains why. Its not just this issue, but this explains a mindset that is not welcoming to families with children, though the people are well-meaning and kind. 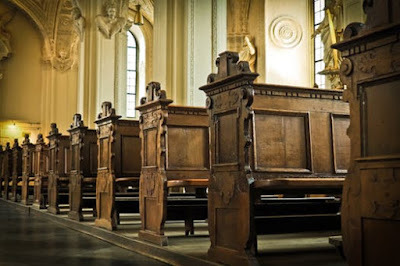 When the building and 'reverencing' a room matters more than the people who want to worship there, it becomes a problem. Could it be called idolatrous? Hm. > What children learn about God has less to do with their Sabbath School lesson, and more with how the adults treat them there. I figured this out when I was a teen, looking for Christ in the church. When I couldn't find that example, I didn't know where Christ could possibly be, if anywhere. Very profound epiphany to reach at that age.